I’m astounded that so many people won’t comprehend that they cannot use pictures and illustrations that they just find on the Internet. The thinking is that if they see it, it’s free to use as they see fit. I have a love-hate relationship with the modern way of doing business. Bloglife doesn’t always have to be a solitary life. “I’m Nobody! Who are you? Oh that Emily Dickinson. Say “poetry” to me and this one comes to mind, although I did have to research the actual poem. The new year is a great time to create something. Today is my grandfather’s birthday, and he would have been amused at how I spent it. I’ve been attending the Blogher conference; this year it’s right here in New York. There are speakers and breakout sessions, networking and parties. The days are long but interesting. It’s great seeing a multitude of women immersed in new media and self expression. Grandpa had three sons. When his first grandchild turned out to be a girl, it didn’t occur to him to treat me as unintelligent. For a few of my early years I lived with my grandparents. Grandma taught me sewing and food prep and how to set a proper table. Grandpa let me watch the news with him and shared his political opinions with me. He was stern but believed in his grandkids. While some anti-education folks married into the family, he announced that I was going to college. I was still in elementary school. Was this an edict, prophecy or call to battle? My grandfather left Ecuador as a teenager. Back then you could work hard to improve your economic status, and he did. He retired a tool and die maker, a skilled tradesman with a love of the English language. He died a few years ago just shy of his 103rd birthday. In his last year or so he started reverting to his language of origin, but always pronounced my name in English. I remember him asking me about words: where did this word come from, why does that bank have its name? Two generations later, I’m using words with a platform and technology he could never have imagined. Happy Birthday to a man whose thinking was a generation ahead of his time. So this is where high standards get in the way of storytelling. I enjoy the blogging challenges; The WordPress, NaBloPoMo and One Word Photo Challenge have all inspired me to see beauty and humor in the everyday. But sometimes the well runs dry. The ordinariness of daily life shows its supremacy and gives everything a grey shroud. It won’t last. Summer is thisclose and I may have found a new (to me) beach to explore about an hour’s drive away. For now, though, I’ll keep my eyes open for visual surprises. We are all aficionados of social media: we blog, read publications on our devices, follow Twitter and create inspiration boards on Pinterest. Ideas and thoughts, experiences and images are shared worldwide. These are good times for voracious readers. Most of these activities are done alone. It’s cozy to connect in my ancient, broken-in jeans and soft, comfortable tank tops. But some social media are designed to get us out of the house, away from the comfort zone and into the world. My favorite is Meetup, a worldwide organization of local groups that share interests and activities. The hub is the website where members can search for groups (called meetups; why invent a new word, I guess), sign up for events, then discuss and post pictures after the events have taken place. I’ve had good times and met great friends through Meetup. I’m pretty excited that I’ve signed up for the Blogher 2015 conference. I will see a multitude of bloggers right here in New York City. It will be like seeing blog faces pop off the screen and into the ballroom with me. I know some people have had success with online dating, a major example of meeting an online person in person. Now that’s social. I like the trend of inviting people online to in-person parties. The website gives all the details, takes your rsvp and adds it to your calendar. No more posting paper invitations on the fridge. There are creeps out there, sure. There are people who post inaccurate pictures on dating websites. There was the guy kicked out of Meetup because he was harassing some female members. There are cyber-bullies. Just like in analog life, we have to be careful, listen to instinct and try to weed out the predators. Recently I searched for some kind of bloggers’ group in my area. I know I have so much to learn and there’s a wealth of wisdom out there. I didn’t find any groups that resonated with me so I am now considering starting one of my own. The main problem is logistics: I need an accessible, pleasant space near me with wi fi. Last weekend I ruled out one spot because it was too crowded, and that made me sad. They had a fireplace. I imagined a throwback to the days before electricity, when people gathered ’round the fire and told stories. Now, though, we would gather around the laptops, readers and smartphones. Illuminated by their screens, we’d share ideas and thoughts, experiences and images. My first guest post! 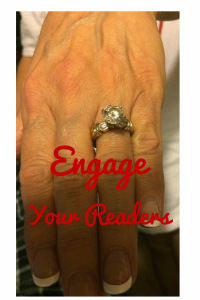 Janice at the helpful blog Reflections asked me to comment on reader engagement. I want to shout-out to http://cindi-keller.com/spain/daydreaming-spain-summer-light and http://litadoolan.net/2015/02/17/happy-pancake-poem who have been with me from the beginning. They both share beautiful words and pictures. And Janice shares great blogging advice! Welcome to my first guest post! Do your stats show that readers are coming to your blog but leaving soon? By looking at your stats page, you can see how long they stay. Are you disappointed? Writing a blog entails engaging readers. Linda and I met at a blogging class we took recently, we struck up a friendship, and I instantly checked out her site. I was shocked by what I saw–smiley faces and the response to them. Linda had written a post about smiley faces. What impressed me more than her creativity (I wouldn’t know what to write about smiley faces,) was how engaged her readers were–I mean they were really engaged. She had 21 “likes” on the post, and she had just written it. There were already seven comments. Seven comments and 21 “likes” on a post just published–I was impressed.